Making a Circle cloak uses a lot of the same principals as making a circle skirt, only you will need wider fabric or a lot of newspaper. First I will show you the 2 piece cloak. This is the easy one to make, but finding fabric that is wide enough may prove to be a bit of a challenge. The second is a multi-piece cloak and will require making a pattern out of newsprint or other light to medium weight paper. I usually try to make the first, but my heavy velvet cloak was made with the second method. After the cloak instructions I will include optional hood instructions. This version requires very wide fabric unless you want a shorter cloak. Measure from the back of your neck to the point that you want it fall. I'm pretty short so fabric that is 50 inches wide is plenty for me to have longish cloak. If you want a floor/ankle length cloak and you are tall, you will need to follow the paper pattern instructions below. If your measurement is between 45 and 60 inches you may have to hunt around for some fabric that will work for you. In the United States 60 inch wide fabric is fairly common, but most of the foreign countries I have gone to fabric that wide has seemed hard to find. There is always the option to order online now. How much fabric do you need? Say you measure and it's 50 inches from your neck to where you want the cloak to fall. You will need at least 4 times that measurement in length (only 2 times if you want a half-circle cloak). You need 200 inches or about 5.5 yards. I usually get 6 yards so I'll be sure to have enough for the hood. You will need an equal amount of lining fabric if you want to line the thing. I would suggest buying a yard or two of extra fabric for you first cloak, especially if you want a hood. If it comes out perfect and you make no mistakes, you have extra fabric for making something else, but if you miscalculate somewhere you'll wish you had it. As far as fabric selection goes you will want something that has little or preferably no stretch to it. The massive amount of fabric will have some weight to it and you may find that it hangs unevenly after a while because the weight of the fabric will make it sag. This is especially bothersome if you want a lined cloak. Trust me on this, stretch velvet may seem like a good idea for one of these, especially since it's usually pretty cheap; but after you cut and sew the first seam you will have to hang it for about a week and trim before hemming. Not fun. Okay. You have your fabric. Lay it out on the floor folded in half. Weight the corners, and place a weight at the center point of a long edge. Tie a string to the center weight at the other end of the string tie some Taylor's chalk or a piece of soap. 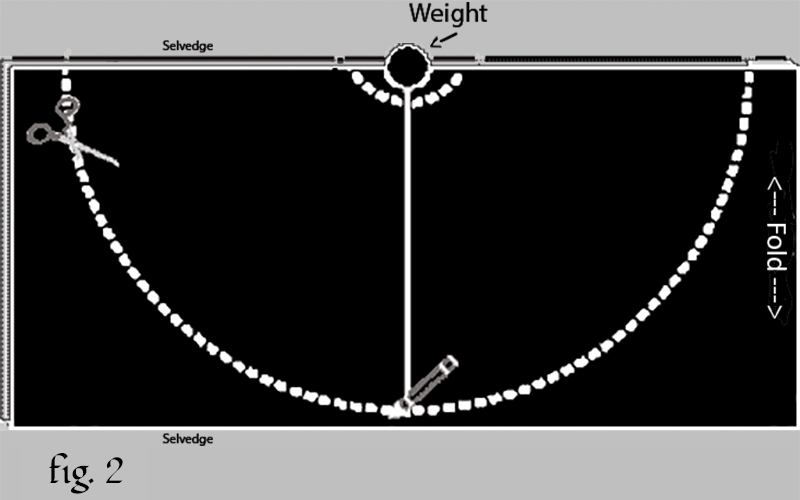 The length of the string between the chalk and the weight should be equal to the length you want the cloak plus an inch or two. Draw a half circle from one side to the other of the weight, then cut along this line. You will also want to cut out a small neck hole... and I do mean small. Remember you can always make it bigger but if you cut it too big you are going to have to fudge the neckline. I'd say cut it about 16 inches in circumference, the string needs to be about 2.5 inches when you draw it. Sew one edge together to make to the cloak a full, but open, circle. If you are lucky, or a savvy fabric shopper you will have found fabric with a pretty selvedge and won't have to hem the front opening. Otherwise turn it under and stitch or add trim. How much trim do you need to buy? The length you wanted the cloak is the radius. Double the radius to get the diameter. Multiple the diameter by 3.14 to get the circumference. Add the circumference to double the radius and that's how much trim you will need to do the front opening and all the way around the hem. Add 16-20 inches to trim the neckline, or to put trim on the hood will require about 40 extra inches. Getting a little extra trim, like getting extra fabric, is a good idea if you can afford it. That way if you miscalculate you won't be left sort, and any extra can be used with cloak scraps to make a small bag or pouch to go with it. Adjust the hem by trimming and hemming as necessary, but if you were careful when you measured and cut, it should simply be a matter of folding the hem under and stitching carefully. Remember when you hem that you want the stitch to show as little as possible on the outside, actually it shouldn't really show at all, but if you put trim on the bottom, this is less of an issue. There are many places to get nifty closures for your cloak. You can use a frog (Two cords ornately wrapped over themselves. One ends in a loop and the other a knot), a Celtic style cloak pin, a cloak clasp, cords, or a buckle of some sort. So many options, check google images or pinterest for ideas. If you want to line your cloak make a cloak out of the outer fabric and one out of the lining fabric, but do not trim or hem yet. (Again... get fabric with no stretch to it or it will sag.) Sew the edges of the 2 'cloaks' together with the wrong sides out, seams showing on the outside (basically inside out). Turn the cloak the correct way out (so no seam allowance is visible). Iron the seams, if the fabric is suitable for ironing, and hang it overnight. After it has been hanging you should be able to tell if the bottom hems are going to match up or not. Make sure the lining does not show if you wear the cloak closed. Adjust the hems by trimming and hemming as necessary. The lining hem should probably be half an inch shorter than the outside hem, so it won't show. This is tricky and it may take a few tries to get it just right. do NOT cut any of the fabrics to shorten them until you are confident that you know what you are doing. It is highly recommend that you get a friend to help you with the hems if you don't have a dress dummy. Wear your cloak and have them pin the hem on inside and outside layers. The way it will hang on a person is very different than how it will hang on a hanger. If the fabric seems to slide around when you wear it, you may want to tack the seams together. Tacking is where you sew a very tiny stitch in one spot ( at the seams as it is less noticeable) in order to hold something in place. I used this method on my velvet cloak, which now hangs perfectly after a few years, but started off being pretty unruly on the first few wearings till I tacked. Top stitching trim at the opening may also help the lining behave. S0 you fell in love with some 45 inch wide velvet but you need a 60 inch long cloak? Well, get some paper and some tape, because you're going to have to make a pattern. Tape several pieces of paper together till you have the length and twice that in width. Mark it and cut as in Fig. 1. Now comes the tricky part. Measure and divide up the half circle pattern so that each slice will fit on your fabric. How much fabric will you need? That depends on how many slices you have and whether or not the fabric has an obvious nap or pattern to it, if so all the pieces will have to face in the same direction and you will need more fabric. My suggestion is to cut out the paper slices, multiply their number by the desired length and double for a full circle. Say you need a 60 inch cloak, you have 4 slices to your pattern, that means you will need 4*60 doubled, 480 inches or about 17 and a third yards of fabric for a cloak with an obvious nap. If your fabric is cotton or something without a nap or pattern you can use approximately one third less fabric and stagger the pattern pieces so they point right and left like a puzzle. Don't forget to leave an inch around each pattern piece for seam allowance as you cut if you want a true circle. After cutting each panel out of the fabric, sew together leaving one pair open and finish like the 2 piece. There are many ways to make a hood. I usually cut out two pieces shaped like the figure below, with those approximate measurements and sew it around the neck of the cloak. You will want to seam around the edges without numbers, i.e. the curved edge, before attaching. I usually cut the neck hole a bit smaller than 16 inches and pleat the hood just a bit in the back... then again I am small. Before attaching the hood I pin it to the cloak (right sides together) starting at the opening and working my way back pleating, folding any excess over itself, when I reach the back. If you are a big fellow or have huge hair, you may want to make the hood bigger by a few inches. Remember to attach the hood before trimming the cloak.